Punti Necessari: 2050 Please note that, for now, you cannot download content from our platform directly onto a mobile device (phone, iPod, iPad, tablets...). You need to download your items onto a PC or Mac, and then transfer them onto your device in the normal way. We are working on allowing direct downloads to mobile devices but this is not possible in the current version of the platform. Sorry about the inconvenience! NOTICE: Activation key must be used on a valid Steam account. Requires internet connection. About the gameThe critically acclaimed card game is now available on PC! 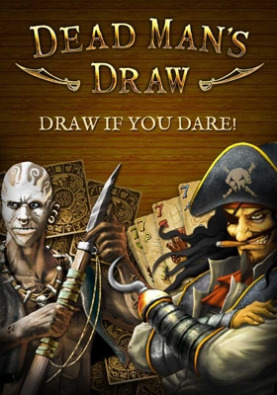 Dead Man’s Draw is a simple and strategic game of luck and skill that boils down strategy gameplay into a single, tense decision: to play it safe or risk everything in pursuit of killer combos and boundless treasure. … Players take turns drawing cards in search of the greatest number of points. The simple point values of each card are important, but their special abilities are even more critical. Swords steal cards from your opponent, Mystics reveal the next card, and combining a Chest with a Key leads to a huge bounty of bonus treasure. Clever use of each card’s special power leads to victory, but daring to draw is just as important – though any card could lead to a dramatic bust, it could also propel you to glory.Traits and tournaments make every game of Dead Man’s Draw unique. Making your Cannon special ability discard an opponent’s entire suit instead of a single card alters the path to victory for both players. Special tournament rules like collecting the cards from your opponent’s busts force you to approach every turn differently. Dozens of tournaments each bring a unique twist, and each of the 18 traits has a profound effect on gameplay. Key Features Risk vs reward gameplay – Simple and strategic card game puts everything on the line for a single, tense decision Create killer combos – Clever use of each card’s special power is key to victory Dozens of tournaments – Unique rules add hours of new twists to gameplay Eighteen game-changing traits – Customize your gameplay with special powers Beautiful art without hardware requirements – Enjoy top-tier presentation and intricately detailed graphics without needing an expensive machine System Requirements Windows - Minimum Operating system: Windows 8 / 7 / Vista SP2 Memory: 1 GB Hard disk space: 200 MB Video: OpenGL 1.5 or Higher Compatible Video Card; 1024x768, 16-bit or Higher Color-Depth Required Sound: DirectX 9.0c Compatible Sound Card © Stardock Entertainment. Dead Man’s Draw is a trademark of Stardock Entertainment. All rights reserved.